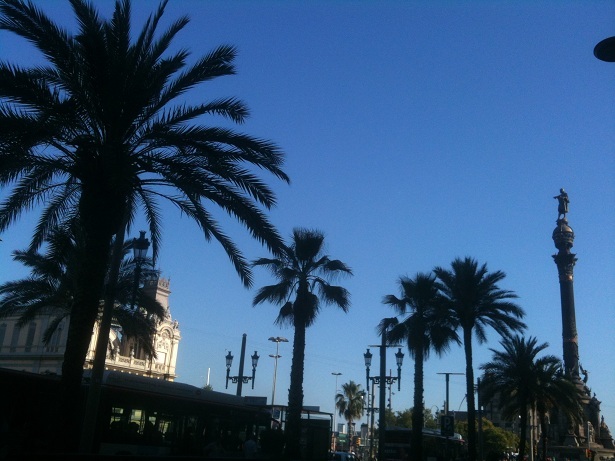 I flew directly from Dublin to Alicante in Spain and went by taxi to Elche. 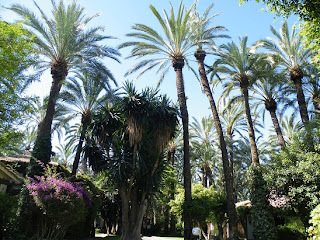 I have been fascinated with Elche for a long time as it has a small but old date industry. The history of Elche is interesting with the Arabs ruling over the land from the 8th century for some 600 years. Still today there are hundreds of thousands of date palms all over the cities, decorating and beautifying the urban landscape. Apparently they are all grown from seed and not cultivated for fruit but are highly valued as ornamentals and kept nicely pruned. The Spanish date industry which does produce commercial fruit is located 38 degrees north of the equator on the Mediterranean Sea. This location is affected by sea breezes which cool the summer heat, equating to a significantly cooler climate than all other date regions including the Riverland, that I'm aware of. 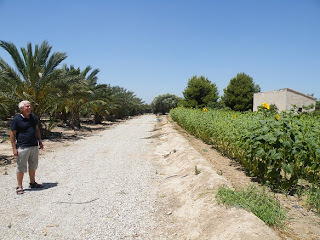 My interest lay in seeing which varieties successfully ripened in Elche and what management methods have been adopted to produce commercial fruit in this region. I was most fortunate to meet with Dr Michel Ferry, a date expert from the date palm research centre in Elche who agreed to show me around. 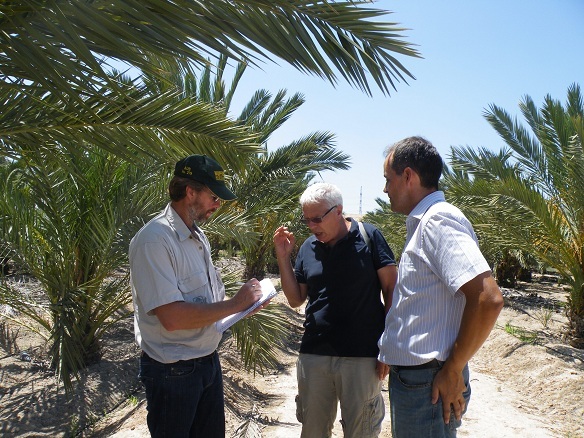 He was involved in sending tissue cultured date palms to Alice Springs from France in the late 1980's so has had some historical involvement in the Australian date industry. Michel met me at my hotel and introduced me to Susi Gomez, a biological specialist in date palm pests. Also Antonio Urban, a date plm grower who also grows Canary Island palms and sells into the ornamental market. This photo: myself with Dr Michel Ferry and Antonio Urban. This photo: Sunflowers are cleverly grown alongside date palms so birds are distracted from the date fruit. We began with a tour of Antonio's date plantation where I had the opportunity to look at some 8yr old Medjool and Confitera varieties, originating from Dr Ferry's tissue culture facility. Confitera is a local variety I haven't heard of. We looked at tree canopy management, discussed pollination techniques, pruning methods and irrigation systems adopted, however the main issue was definitely the Red Palm Weevil. This pest has in recent years been accidently introduced to Spain from Egypt in a shipment of ornamental palms. It has subsequently infected wide regions of Spain, killing many date palms. The Red Palm Weevil originates from Asia. It is large (matchbox size) and lays its larvae in the palm trunk. The larvae eat the trunk from the inside out, killing the tree. 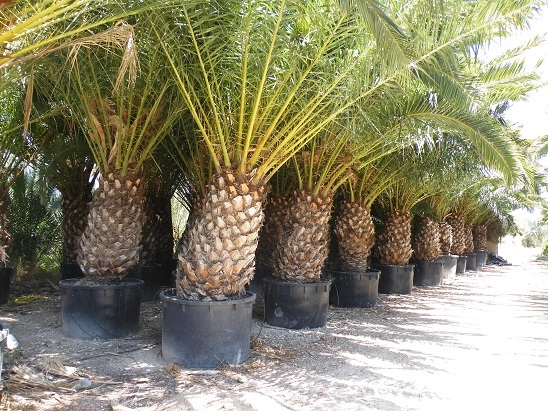 Consequently this infestation has stopped expansion of both the date industry and ornamental palm trade as customers lose confidence in the life expectancy of their palm purchases. This photo: Huge potted Canary Island palms ready for sale. 1000 & 1500 litre pot sizes. Red Palm Weevil is the #1 pest problem for date growers throughout the world and has been introduced to nearly all date growing regions over the last decade or so with major negative effects. It was recently discovered in the USA but at this stage not in Australia that we are aware of. Wealthy nations have been investing many millions of dollars into finding technologies to combat this pest. Elche was famous for producing ornamental palms and sending all over the world but trade has significantly reduced with the news that Elche has the weevil. Antonio Urban and family were big suppliers into this market. They have approx 500,000 large Canary Island palms ready and waiting for sale. 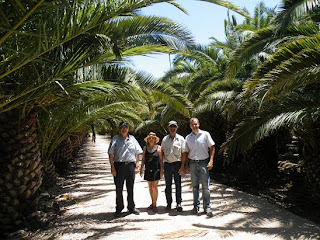 This photo: Standing amongst ornamental Canary Island palms looking at Red Palm Weevil management issues. Owner Antonio Urban (far left) Susi Gomez (biologist), myself and Antonio Urban jnr. Dr Michel Ferry is held in high regard internationally for his campaign on controlling the Red Palm Weevil. 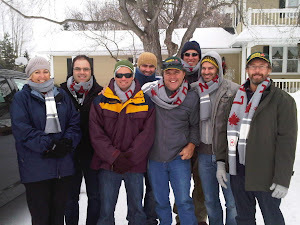 He is involved in assisting some other countries design and implement control programs. All of the trees at Antonio's property have a small probe inserted in the trunk where once a year a systemic insectide is injected to control the larvae of the weevil. This seems to be the most cost effective method for ornamentals however for fruit production this method can result in chemical residues in fruit. There are a number of varieties ripening successfully in Elche, some of which we have here in the Riverland. I was also extremely keen to hear of the methods developed to artificially ripen fruit which involves harvesting dates at the khalaal or semi ripe stage and lightly freezing for a prescribed length of time. This helps the fruit ripen when returned to room temperature and also reduces labour inputs as whole bunch harvesting is possible. I was taken to a tool shop supplying a wide range of specialty knives used to prune and de-thorn date palms. We've developed some of our own tools over the years but I could not pass up the opportunity to acquire these different tools. I now have 3kg of large, medium and small sinister looking knives in my suitcase with 8 more flights ahead. I'm a little nervous about explaining their use to customs officers!! My trip to Elche was very worthwhile and I'm pleased to have made the acquaintance of Michel, Susi and Antonio and will continue to exchange information which can mutually assist. After leaving Elche I travelled up the Spanish coast via Alicante, spending a couple nights at Benidorm and moving past Valencia and onto Barcelona. Along the way I enjoyed seeing the different models of Mediterranean horticulture from my bus window. Citrus, olives, stonefruit, figs, pomegranates, tomatos and vegetables. 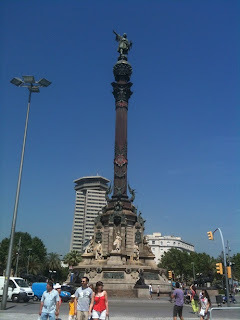 I finished with a couple days looking around Barcelona before leaving Spain for my next destination of Cairo, Egypt. 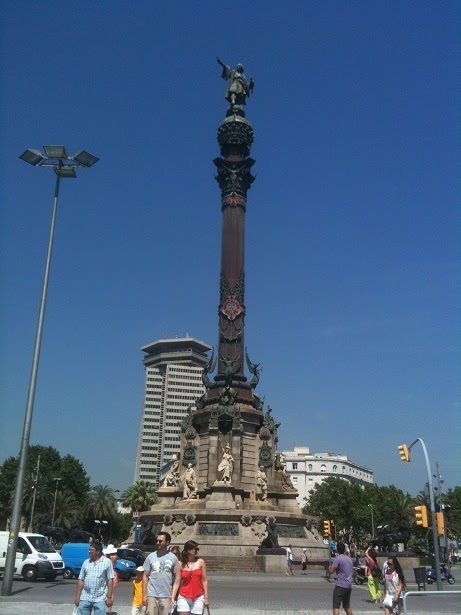 This photo: Christopher Columbus monument in Barcelona.